1st Ever Grammy Awards Held. 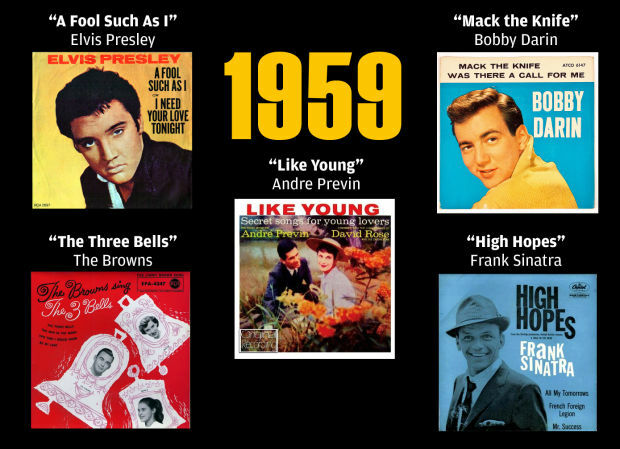 On May 4, 1959, the first ever Grammy music awards were held, with no category for rock and roll despite the fact that this new type of music had already long taken the country by storm. The big winners with 2 Grammys apiece were: Ella Fitzgerald (Best Pop Vocal Performance by a Female and Best Jazz Performance by an Individual, for compilations of a Irving Berlin song and a Duke Ellington song, respectively); Henri Mancini (Best Arrangement and Album of the Year, both for The Music from Peter Gunn); Ross Bagdasarian, Sr., better known by his stage persona of David Seville, (Best Comedy Performance and Best Recording for Children, both for “The Chipmunk Song”); and Domenico Modugno (Song of the Year and Record of the Year for “Volare“). The winners who most closely approached rock and roll were The Champs with “Tequila” for which they received the Grammy award for Best R&B Performance. In all, only 22 Grammys were awarded that first year, far fewer than the 83 categories recognized in 2015.